A Few Scraps: FMQ Weekly: Busy is your friend! I've been stretching my FMQ muscles a little...on a long-arm! I finished one of my grandma's unfinished quilts on the long-arm of my friend Nancy who rents time on the machine locally. Quilting on a longarm is so different from my domestic machine. It's very smooth and I'd say it shaved a couple hours off the time needed to finish the quilt. But things that I have so much control over sitting down, like travel stitching and echoing, just look bonkers so far when I do them on the long-arm. And that's ok with me. My students are willing to step into that discomfort of trying something new even though at first the results will be awkward. I can do that too! With this quilt I decided to stretch my approach to FMQ a little. Mostly I'm experimenting with how to get different patterns to play together. How do you think I did? That's a trick question! Because seriously, can you see anything more than a few inches of quilting here or there? It's next to impossible! 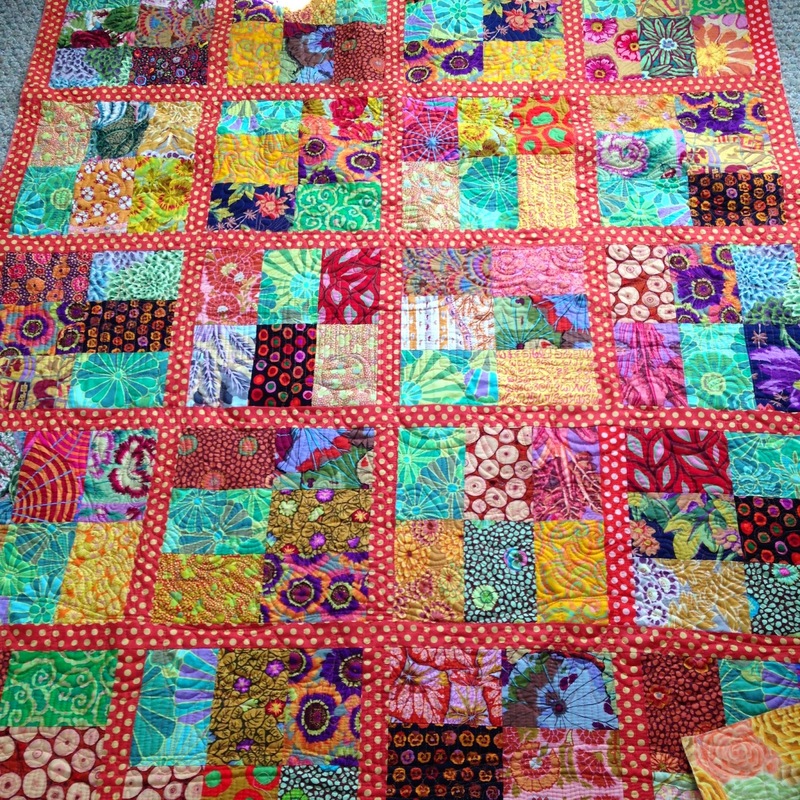 My grandma's love for these busy, colorful Kaffe Fassett prints resulted in a lovely quilt and a perfect setting for stretching a little beyond my skills: because as Nancy said "you could be quilting swear words into that quilt and no one would know!" If you're ready to try FMQ, or to experiment with something new like a more complicated quilting design, might I suggest that you do it on some busy prints, with matching thread? Let the quilt be all about the fabrics. You get all the benefits of practice, and a beautiful finished project. Here's a little view of the back: that's Kaffe too, naturally. When I got to the part where you wrote "How do you think I did?" I squawked "Ah! I can't tell!" LOL, which it turns out, is your whole point. 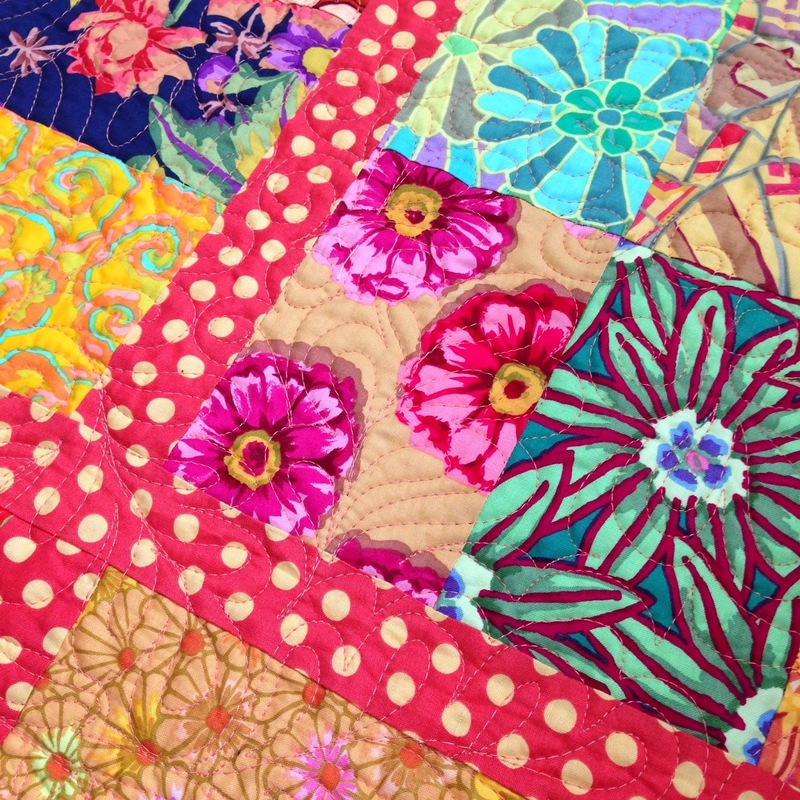 :) Your grandmother's beautiful, colorful quilt is the perfect example for us Christina. For the quilting we can see, it looks like you will be a natural on the Long Arm too. Your friend Nancy is really funny - loved her "swear words" comment! Space is always a problem with a long arm, but as far as price goes, you might take a look at the Block RockIt - It's only a 14", but I tried one at Paducah a couple of years ago and it really feels like a quality machine. And it's VERY reasonably priced. I think we're going to get one for the quilt ministry this year at Paducah. 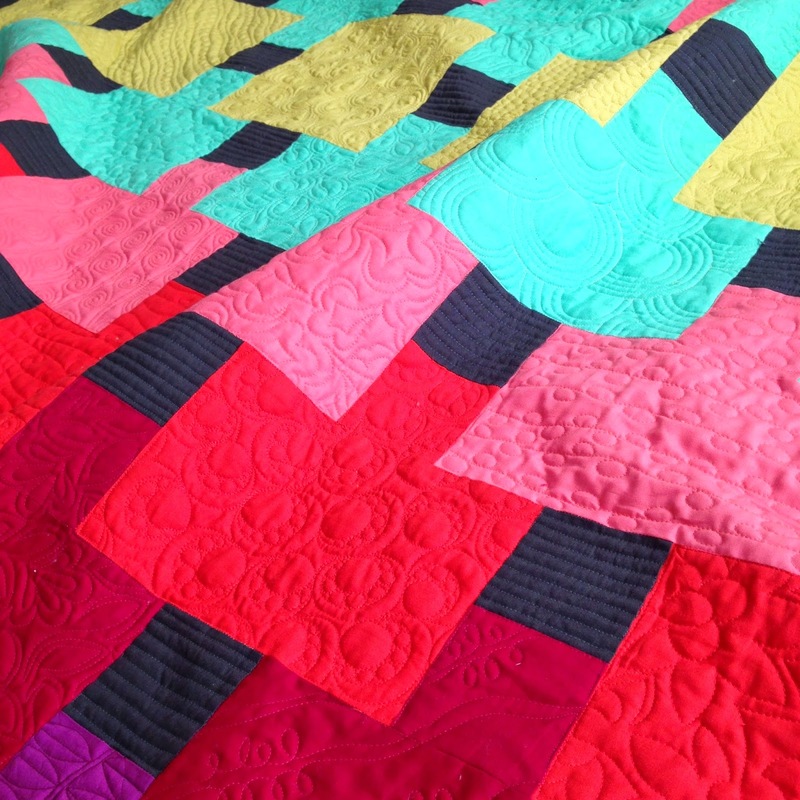 And from what I can see, your quilting is lovely - but busy quilts are the best way to learn to use a long arm, because your "oops" moments don't show! I've been FMQing on my domestic sewing machine for about 6 years and I had a chance to use a long arm once. It did move so easily around the quilt and I think I could get the hang of it pretty quickly, but I really don't like standing up all day to do it. I think it might be nice for a really large quilt, though. But I have quilted king size on my own Janome. It really feels good to get it done myself. Oh, and I love your blog and the ideas you share! Thanks! I love your Grandmother's quilt - and all the big wild prints with the polka dot sashing! I honestly can't tell you had any mistakes - your stitching looks as lovely, flowing, and sure as always! I love your idea of renting time on a longarm for only when you have a big quilt. FMQ on a DSM is so intimidating and impossible for me!! I bought my Innova 18" nine months after I pieced my first quilt and a week after I had put the frame together I had my first customer quilt on the frame. LOVE longarm quilting! Your grandmother's quilt is perfect for practicing and learning, because all the viewer sees is texture!! Yep, those backtracks are much harder with a longarm - just had a class with Kimmy Brunner and she says that with doing the bump-bump feathers, she's pleased when she hits that backtrack perfectly 70% of the time!!! So even the awesome show quilters have issues with that!!! The key to longarm quilting is to look where you want to go - just like you do when you are driving a motorcycle or car!! Go and play again...but be careful, you'll fall in love and have to get your own!!! I'll bet once it's washed you'll be able to see the quilting a little bit more ~ nothing like a freshly washed quilt! Your Grandma had such a eye for color and those polka dots are fab! Lol! You hit the nail exactly on the head! Everyone is always so anxious about their stitches, when it reality you seldom see the stitches individually anyway. I'm just getting an opportunity to use a long arm too, and will definitely far from smooth on it for awhile, but we gotta keep learning, right? Looking forward to seeing your new pattern out. Cheers! 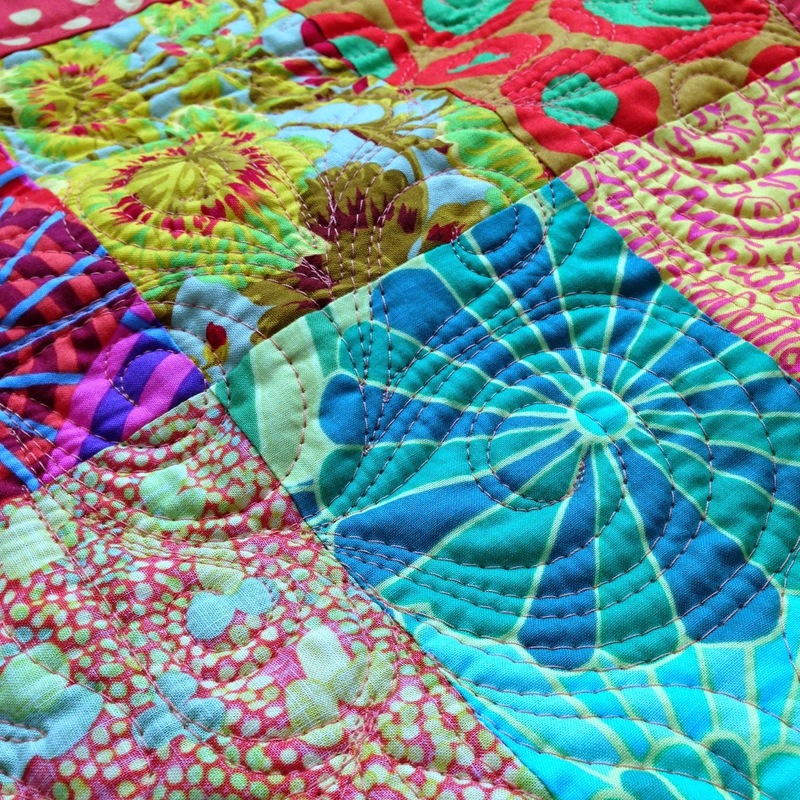 I loved this quilt at first glance because I too love Kaffe Fassett fabrics. I can never afford them though. I'm sure I would have loved your grandma as well, just from the way you write about her. Wow, your grandma had amazing taste and colour sense! Love all things Kaffe. I always was taught to have a busy backing to hide not-so-lovely quilting stitches, but genius to have a busy front too when practising!! And you've described the difference on the domestic to the longarm perfectly. I have both (saved literally for years for the LA, my present to me when I quit teaching) and it's a whole other ball of wax (thread, lol) as compared to the DSM. I just might do this (make a busy top) to get the hang of being back on my LA (been in Florida for nearly 5 months!) when we head north next week. This just really makes me smile. Cristina, I have issues with my back and neck. Do you think long arm vs domestic machine would be better on the back? I was thinking that standing might be vetter than sitting. We have a shop that is relatively close by that rents time on their long arms. Thoughts? Love this quilt. Your grandma had great taste!! What a lovely quilt your grandmother made. She left you a wonderful legacy. 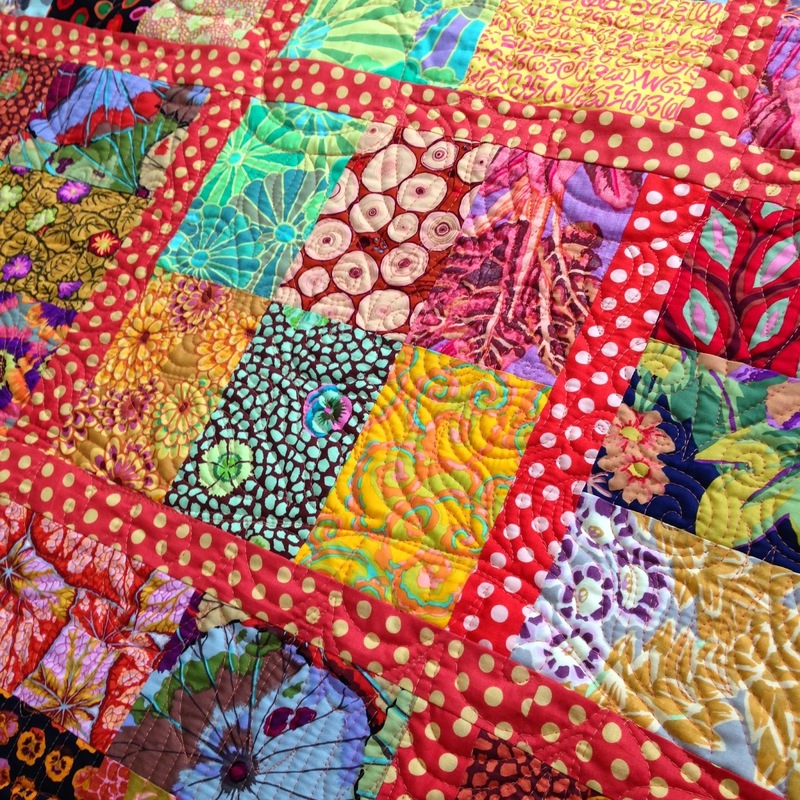 She would be so pleased that they will be finished and with such beautiful quilting. I think you should check it out. There are some ladies in our guild that say they need chiro after FMQ on their domestic machines but do fine with the long arms!